I need not explain what planet that is. Click to massively embiggen. 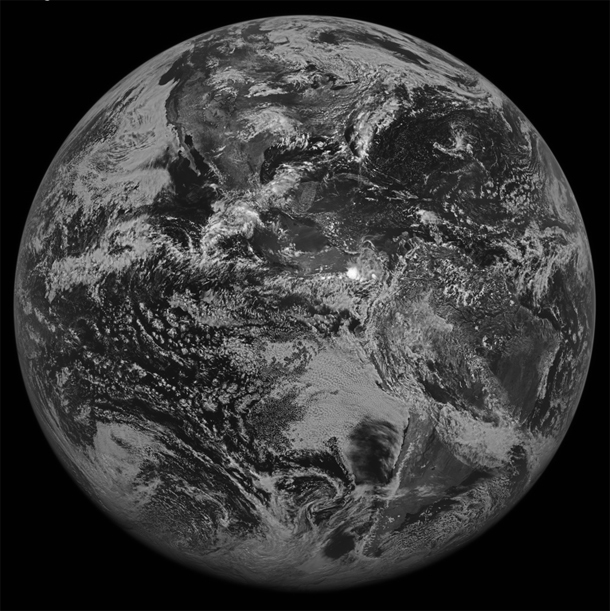 It’s the first full-disk image of the Earth from the GOES 14 satellite, launched in June of 2009. The image was taken on July 27, from a distance of about 36,000 km (22,000 miles). It’s a visible light image, so pretty much what you get is what you see. The resolution of the data is about 1 km (0.6 miles). Wow. The GOES satellites (there are three others flying at the moment) track dangerous weather such as hurricanes, and can save millions of dollars and hundreds of lives. They are run by the National Oceanic and Atmospheric Administration, and are a great example of how space exploration and your tax dollars can be put to good use. And man, it makes a very fine picture too, doesn’t it? There’s no place like home. Tip o’ the rain hat to Fark.